They call them microclimates around here, which is exactly like it sounds. Go a few miles to the north or south in the Bay Area and it’s the difference between a foggy film noir and A Roman Holiday. It’s especially muted right now for those of us in San Francisco. During these summer months, the fog rolls in like cat fur. While everyone else is out having BBQs, we’re pulling on light sweaters and boiling tea. But there’s an easy remedy for that. Josh and I have taken to driving north to wine country on those dreary summer days to catch some of the sunlight and warm breeze. The famed Napa has been an easy favorite. But a little while ago, we tried a new getaway: Dry Creek Valley. 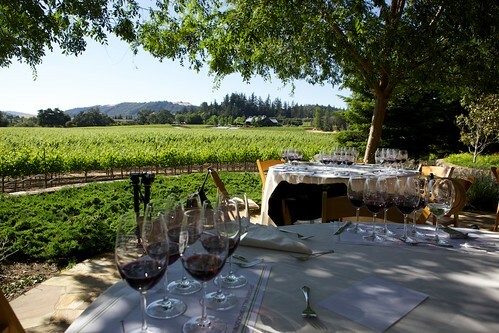 Sure, Napa Valley is a landmark destination with famous, brand name wineries and tours. That will always be there. But at Dry Creek Valley, a 9000-acre stretch of wine country, we found a cluster of smaller batch, family-run winemakers, which created a very different experience. Dry Creek Valley is actually one of the oldest wine regions in California, dating back to the days following the Gold Rush of 1849. 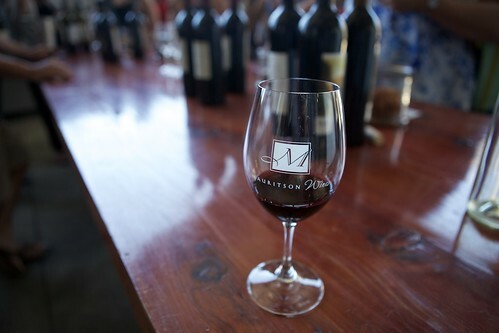 Those who had taken part in the frenzy settled in the fertile valley near the Russian River and planted vineyards of Zinfandel, now the region’s most famous wine. During Prohibition, most wine production stopped. But the region resurged in the 1970s. 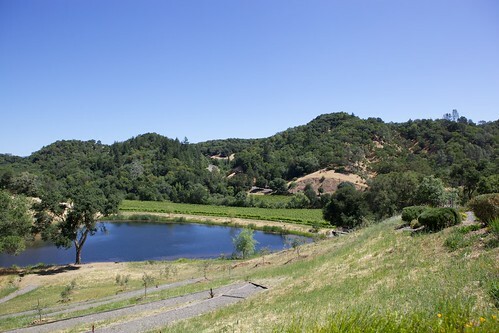 Today, Dry Creek Valley is home to over 70 wineries, most family owned and operated. The Winegrowers of DCV invited us to visit the region along with a handful of other writers, and we all climbed into a little bus that took us through the city, over the Golden Gate Bridge, and into glorious, glorious wine country! The thing that I love about wine is that wine grapes are like sponges. A little southwestern breeze of vanilla will alter the flavor, as will a winter that’s too harsh or a summer that’s too scorching. 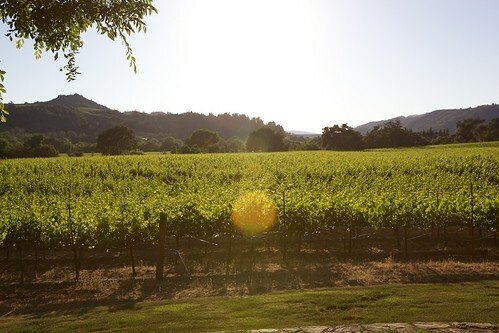 Because of that, wine country—Dry Creek Valley included—is always perfectly pleasant. The air smells sweet and the weather is always temperate. 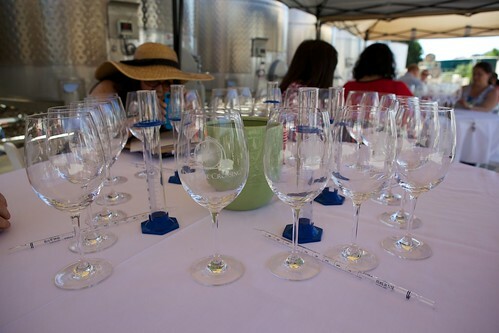 We first went to Fritz Winery, where they led us through an aromatics seminar. A little sniff of strawberries, chocolate, anise, and blueberries to see how it matched up with the wine (a refreshing mix of Sauvignon Blanc, Rose, Zinfandel, and Cabernet Sauvignon). 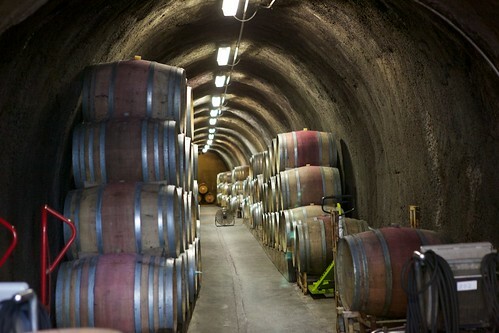 The wine caves of Fritz. 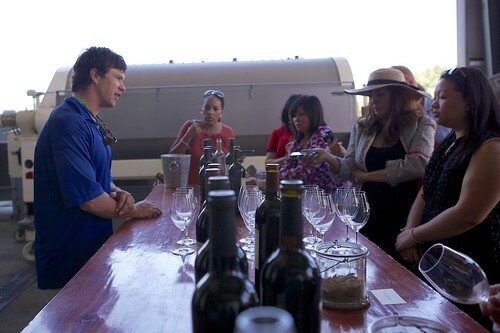 After Fritz, we climbed back into the bus and headed to Mauritson Winery, where we were to participate in soil tasting. As it turns out, for all of the comfortable weather, the grapes don’t necessarily have it easy. For grapes to produce good wine, they must undergo some hardship. They must be pruned to produce good branches and good fruit. And they must live in rocky soil. The rocky soil stresses the plant and causes it to produce chemicals that thicken the skin. 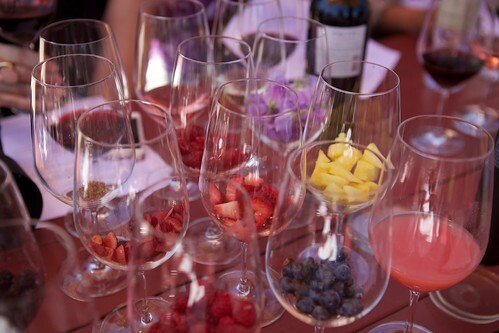 For some varieties, skin like that produces better tasting wine. Such rocky soil is one of the pluses of Dry Creek Valley. Luckily, there was no actually eating dirt in this seminar! It was all about how the quality of soil—rocky or moist or peaty—affects the product. 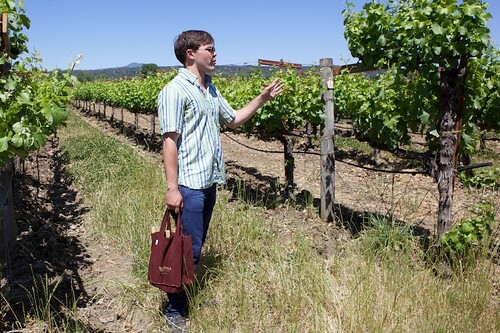 Then we went to Quivira, which was an organic vineyard. "Organic" is actually a pretty difficult certification to receive. It requires unconventional methods to make the wine. Our guide slung some cold wines into a cute little sack (see below) and took us through the vineyards, walking through the grass and among the branches. Funnily, the destination was the compost pile, which turns out to be a very innovative aspect of organic grape growing. 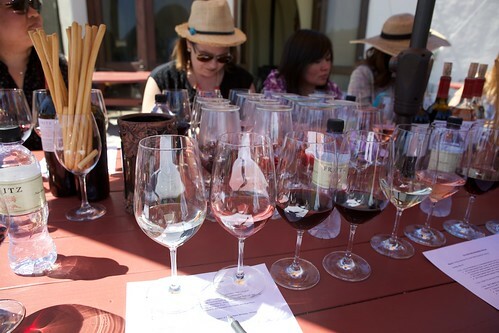 So, the whole media trip, the organizers joked about some kind of wine blending "smackdown." I thought they were kidding. As someone with test anxiety, how could I ever come to drink wine under such pressure? Well, to my horror, it turned out to be very true. We headed over to Dutcher Crossing where we were sat down at white-clothed tables and given glasses, vials, pipettes, and single-grape wines. I looked around. Everyone else was confidently mixing. Josh was talking smack to the other mostly meek-looking writers, making fun of everyone for having it in the bag. The others looked smug. Naturally, I panicked. Taste, panic, mix, panic. Taste, panic, mix, panic. I was the very last person to finish, to the point that the organizers needed to usher me out because I was holding everyone up. I was sure that I lost. I was so embarrassed to even have anyone taste it. But in the end, I placed third! Josh didn't even place (that's what ya get for smack talking!). The finale was a stunning dinner at the personal home of Debra Mathy, the proprietor of Dutcher Crossing. It was May, and we were entering the crest of summer. The evening was bright and warm, and the air smelled sweet from the nearby grapes. 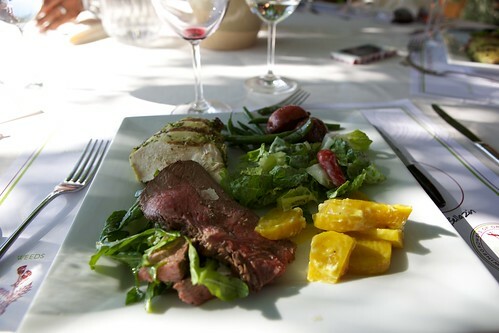 We enjoyed plates of cold beets, grilled chicken, and rare slices of beef along with a beautiful array of Viognier, petite verdot, cabernet sauvignon, zinfindel, and sauvignon blanc from Thumbprint, Collier Falls, Amphora, and Dutcher Crossing. Lastly, we got to meet a bit of a celebrity! Last January, I bought a Wine Dogs calendar for $5 from Silver Oak. I love that thing. And lo and behold, I got to meet one of my favorite dogs from the calendar! Dutchess! She is every bit as beautiful and sweet as she looked in the calendar and more. 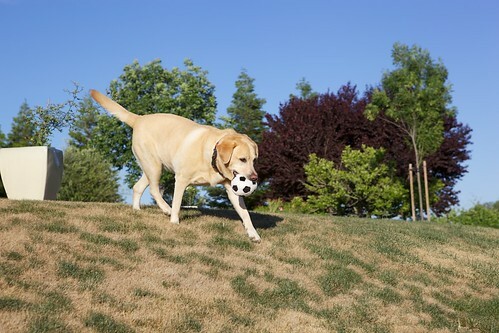 What an adorable yellow lab. 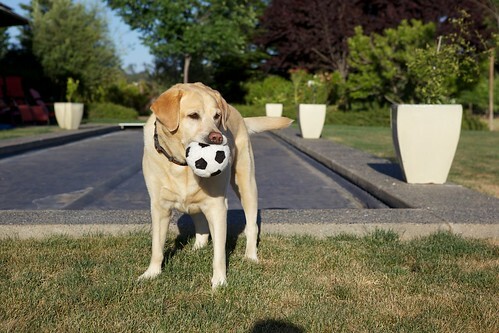 If you go to Dutcher Crossing, you might get to meet her, too. Loved this post! We recently moved to the California Central Coast, they have some awesome wineries out here too!